How’s that heavy laptop bag treating you? Does it ever make you feel like you’re lugging a bag full of golf clubs over your shoulder? If that’s the case, you and your aching neck may be interested in the latest innovation in man-purse technology: The OGIO Shling. OGIO, a company that makes bags for a wide variety of sports, including skating and snowboarding — but appears to spend a lot of time on the golf course — is introducing the Shling on two lines of golf bags, which should at last be available in sporting-goods stores and golf shops this month. Here at the Satchel Pages, though, we’re much more interested in the company’s Boss Messenger Bag, which will be available in a Shling version by this year’s holiday season. Other custom bags designed expressly for the Shling will be available early in 2007. The Shling is a molded carrying device — laden with several new patents — that allows the weight of a heavy bag to be distributed evenly on two shoulders. Gee, sounds like a backpack, we can hear you say. Ah, yes, but the Shling is a yoke with a handle, designed to be shlung onto both shoulders shimply, in one shweeping motion. Sure, you say. Sho what? Well, the OGIO folks claim the Shling directs the weight of your bag more appropriately onto your shkeletal shtructure, so it feels lighter. And the Shling has sushpended shtraps, which cushion against shocks. Show me, you say. So we point you to the video on the OGIO website, which provides a lengthy but thorough introduction to the product . . . for golfers. The strap is designed to distribute the bag’s weight evenly and let you stand upright easily. But I found myself tilting forward anyway. And it wasn’t comfortable on my shoulders, though I tried adjusting the strap to fit my 5′1″ frame. I felt like a yoked ox. 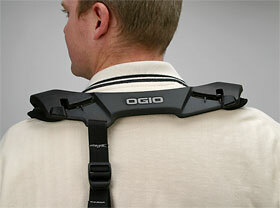 We want to ensure your readers know that the OGIO Shling is not designed for every body type. This first model is designed to accommodate the average man’s build. As . 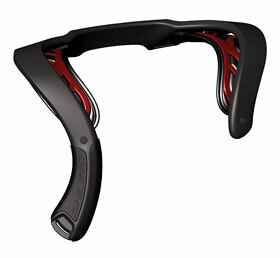 . . the review in Gearlog pointed out, they tested the Shling on what appears to be two extreme body types — a much larger man and a very petite woman. We intend to release models in the future that accommodate a wider range of body types, and of course will use any feedback — positive or negative — to make the Shling the ultimate carrying solution regardless of body type. Overweight or underfed laptop luggers, do not despair. Advances in man-purse technology will be coming to the rescue. Shling!!! This entry was posted on Tuesday, April 25th, 2006 at 9:26 pm	and is filed under Backpacks, Fashion, Laptop Bags, Man Bags, Man Purse Technology, Manufacturers, Messenger Bags, Shoulder Bags, Straps. You can follow any responses to this entry through the RSS 2.0 feed. You can leave a response, or trackback from your own site.